In the ongoing earnings season, microblogging website Twitter recently disclosed its earnings report for Q1’16 and yet again, investors are not too happy. Its largely a recap of previous quarter. Twitter posted revenues of $595 million which even though grew 36 % from a year earlier, fell way below the average analyst estimate of $607.8 million. However, the company narrowed its loss to $79.7.million, or 12 cents per share, from $162.4 million, or 25 cents per share, a year earlier. It also beat the earning estimates by reporting non-GAAP diluted earnings per share EPS of $0.15 against analyst expectations of 10 cents per share. The user growth, which has been the most pressing concern for Twitter at the moment, remained sluggish but still managed to beat the expectation with users rising to 310 million against Wall street estimate of 308 million. Compared to last quarter where users remained flat at 305 million, MAUs showed a positive growth this quarter and increased by 3% year-on-year. According to Chief Financial Officer Anthony Noto, product improvement had improved user retention and both “seasonality” and “market initiatives” had driven growth. On the advertising front, Twitter saw year-on-year growth of 37% in advertising revenues recording $530 million from ad sales. But compared to last quarter, the revenues have fallen from $640 million. Year-over-year revenue growth from large brand advertisers was softer than expected, although brand advertising remains our largest overall contributor to revenue. Referring to its recent deal to stream NFL games , the company also reiterated its strategy to develop Twitter as a platform for live events, engagements, and updates, particularly in sports segment. As we outlined last quarter, we’re focused on what Twitter does best: live. Twitter is live: live commentary, live connections, live conversations. 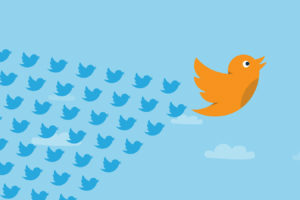 Whether it’s breaking news, entertainment, sports, or everyday topics, hearing about and watching a live event unfold is the fastest way to understand the power of Twitter. Twitter has always been the place to see what’s happening now and our continued investment in live will strengthen this position. said Twitter in its report. COO Adam Bain also said that Twitter wanted to boost monetization for its live-streaming service Periscope and expand promoted video options on the platform. However, despite these claims and hope of boosting ad revenues through videos, the second quarter forecast by Twitter was not at all encouraging which perhaps led its shares fell down by 13% after it posted the results. Twitter has forecasted a second-quarter revenue of $590 million to $610 million which is well below analysts’ estimates of $678 million. On the earnings front also, Twitter is forecasting between $145 and $155 for Q2, while analysts had expected $173 million.